The ratio shown here (2:3) was formally adopted in 1984. The type of eagle on the flag drawn by Željko Heimer is that used by the Western Austrian flag factory; the flag drawn by Peter Diem is that used by the Eastern Austrian flag factory. The latter is heraldically better because the constitution prescribes a sable (black) eagle. The former flag tends to make the eagle appear grey on actual flags. Who is entitled to use this flag? The red white red flag with the coat of arms is used as the Government flag and by the army. As you can see from http://www.peter-diem.at/bundeswappen.htm the Landeshauptmann (Land prime minister) has the right to use the federal coat-of-arms, but I have never seen him doing this. The prime ministers elected by the nine Land parliaments are indeed, according to the constitution, also organs of the Federal Administration, but only "also". They draw their whole legitimation from the Land - they act more against the Federation instead of for the Federation. Therefore I assume that a car flag used for official occasions would be only the state flag/state service flag (Landesflagge/Landesdienstflagge). As municipalities do not have federal functions, they have to show the plain national flag. Practice frequently does not follow the legal prescriptions, though. The flag manufacturer Gärtner/Mittersill floods the country with federal service flags with "grey" eagle, which are also used frequently for waving during sports events. 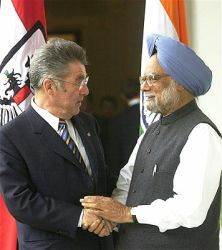 Yesterday I saw a report of Austrian TV ORF about Federal President Fischer's visit in India. The eagle on the Austrian flag was on a shield and turned on 90 degrees, perhaps to avoid the coat-of-arms laying on its side, when the flag hanging on a pole. The really interesting stuff is the eagle itself. This eagle is totally different from the actual Austrian arms (see above). I haven't ever seen this type of eagle. However, as in Germany, there are several eagles around for different purposes. For instance, the eagle in the Austrian parliament is strikingly different from the official arms as well. As a matter of fact, years, if not decades, before the present Flag Act was passed by the Austrian parliament on 28th March, 1984 - probably on the occasion of the death of Federal President Karl Renner in 1950 - the protocol department of the president's office or the chancellery must have ordered a special "funeral flag". 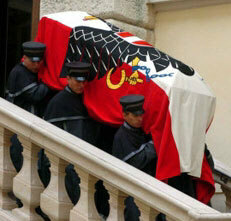 This flag has been in use at all state funerals since, covering the coffin of the deceased head of state or chancellor. I submit three pictures of this flag taken at the funeral of Thomas Klestil in July 2004. From a heraldic point of view, nothing is wrong with the eagle - it is just another artistic version, but there is no violation of its blazon. From a vexillological point of view the eagle should of course rest in the center of a horizontally striped flag - but this was not stipulated in the early years of the Republic. It will be a hard job to convince the authorities that the funeral flag should be changed so as to conform to the present Flag Act.